The hope crowd is still waiting for change yet the change is not making most voters happy. The majority of Americans do not approve of our nation’s position today, they want to make things right. All of the left turns no longer have people dizzy, they are now focused, ready to reset. The way back is clear. Unemployment has been increasing beyond Obama’s control so after checking Gallup, we use their monthly charts, we found approval for Obama has exceeded disapproval only once since June 18th. The idea of HUD funding ACORN, more spending, or paying another terrorist’s civil trial are not going to change the polls. It’s time to pull the spending needle out of America’s arm. The political opposition to nationalized healthcare within Congress is conspicuous by its absence. Despite the presence of widespread and deep public opposition to “Obamacare,” many politicians are pretending like the upcoming election is not a referendum in some aspects on big government power-grabs like nationalized healthcare. Despite this level of public opposition, politicians are tending not to run on the repeal of Obamacare. Part of the explanation for this disturbing state of affairs lay in Congress’ exemption of itself from inclusion in the healthcare system that it would legislatively impose on the citizenry at large. President Obama’s waivers for mandated healthcare coverage continues the trend of the political class issuing arbitrary exemptions from this law. Arbitrary fiat of this kind accrues personal political power to individual politicians under the guise of “democracy” by allowing them to misuse government power to patronize specific interest groups. These interest groups tend to operate on a quid pro quo basis with politicians, as they often contribute campaign funds and issue other political favors in exchange for taxpayer subsidies, grants, or loans, or relief from burdensome or oppressive laws. Therefore there are checks instituted in The Constitution not only to prevent the accumulation of political power, but to present barriers to the capricious institution of sweeping national measures on the basis of bare popular sentiment, or by the determined will of a power-hungry minority. The amendment process was embedded in The Constitution to allow a means for a policy or program to become established in accordance with a broad and deep consensus of the people and the states; amendments by design require high thresholds to ratify. That the amendment process is largely ignored by the government as the legitimate method of instituting broad and sweeping federal authority over the citizenry is a major sign that our Constitutional republican system is becoming undone. The common justification for ignoring the Constitution among our intellectuals and politicians is that we have a “need” for greater democracy. One measure of “democracy” in the world can be found by proxy in the level of public debt. Though an imperfect proxy, because military spending contributes greatly to national debt, there appears through comparison of global charts, graphs, and statistics to be a connection between high levels of public debt per capita and eventually popular, though ultimately unsustainable, social welfare programs such as universalized medicine. politicians is the reason for its tacit and overt support in the government, especially as the elites have exempted themselves from what certainly will be a degrading system in terms of quality and human dignity. The best indicator of a nation’s living outside the constraints of economic reality is public debt. Even further, public debt is largely driven by welfare spending. But what distinguishes nations with moderate and sustainable levels of debt and those with unsustainable levels of debt is universal healthcare. Two graphs will illustrate this point. Below I will post a chart from “The Economist” on public debt per person around the world (linked here is the interactive chart). Nations with higher levels of debt are in red, and include the United States. The chart has the U.S. at 59.2% public debt-to GDP, while per capita debt is at 95% debt-to-per capita GDP, and total federal debt is 95% debt-to-GDP. Stimulus was a must pass ASAP in order to create 3-4 million new jobs by 2010. In November of 2009 the NYT wrote: “With Congressional Democrats in near-panic amid forecasts that unemployment will remain high through next November’s midterm elections, a party leader said on Thursday that the House will pass a new ‘jobs bill’ before Dec. 18.” What was originally Stimulus II eventually became the new Jobs Bill. Two weeks prior to the 18th Obama told news media followers that job creation was not the goal of a jobs forum. The bump in Obama’s road to recovery just became even larger this morning as last months total national unemployment grew. In light of the fact that more people have given up looking for jobs in this recession the now 9.2% is fictionally low. It’s quite racist from the black perspective. Before the number was made public the regime abandoned ship on employment. We told you long ago 10% was the goal, query it, nobody with an IQ over 100 could believe this spending could allow it to fall into the 7% range, that was the hope crowd. Who pays attention to unemployment anymore? Obama cannot run on his record, it’s a total disaster! What can he promise with regard to jobs, even fewer? Who would not believe him? More spending? Again, who would not believe him? Higher taxes, something to believe in. Lower GDP, no question! Why does he run against himself? He does not want energy independence, opportunity, freedom, religion, borders, a Constitution, a military, home ownership, right to work, private health…, nor do his supporters. Coming clean on jobs was a big step. The table has been set, it’s time to step up and fight to either serve his menu or throw it away. l Ignored the debt problem for two years by kicking the can to a commission. l Promptly ignored the commission’s December 2010 report. l Delivered a State of the Union address in January that didn’t even mention the word “debt” until 35 minutes in. l Delivered in February a budget so embarrassing — it actually increased the deficit — that the Democratic-controlled Senate rejected it 97 to 0.
l Took a budget mulligan with his April 13 debt-plan speech. Asked in Congress how this new “budget framework” would affect the actual federal budget, Congressional Budget Office Director Doug Elmendorf replied with a devastating “We don’t estimate speeches.” You can’t assign numbers to air. via The Elmendorf Rule – The Washington Post. Last week Obama once again warned us about delaying yet another decision, the budget America has not seen: “There’s no point in putting it off. We’ve got to get this done. And if by the end of this week, we have not seen substantial progress, then I think members of Congress need to understand we are going to start having to cancel things and stay here until we get it done.” He continued on about his complete dedication, involvement with Afghanistan, bin Laden, and the Greek crisis. No different than his ‘dedication’ to anything else since walking into the Oval Office, before week’s end he was in the air on his way to another vacation. 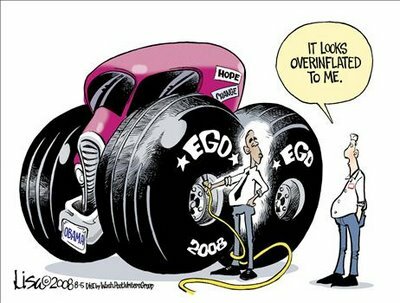 That Friday afternoon a story was tucked away in the bowels of the news media stating that jobs created/saved by his stimulus came at a taxpayer cost of $278,000 each. 2- Step one was a rescue package that means making sure taxpayers get their money back. The middle-class need a rescue package. That means tax cuts for the middle-class. It means help for homeowners. It means we are helping state governments set up projects that keep people in their jobs. We’ve got to fix our health care system, we’ve got to fix our energy system. The Tea Party was a great influence on the GOP which, did not throw money away like the liberals, overspent. The Tea Party, a wide variety of people, not only focused on smaller government, they insisted on less spending. How long has the compromising been occurring and why is it such a mystery that America is looking over the edge of the cliff today? Obama not only lied on the Bush debt numbers, he lied on everything that followed. Promises followed compromises, and like Lucy, every time he put them out for the deal, he pulled them away after it was done. How long ago did we give him unemployment extensions to maintain the Bush tax cuts? Now he wants to pull them away? The states that have job wanted signs in the windows of businesses cannot find takers, look at N Dakota. Employment extensions were not provided to assist anyone, how is that program working in Europe? They’re trying to take the government benefits away from Greece and France. If you want to argue Obama is a victim of circumstance cut and paste it somewhere else, if it was not his goal he would address it. There never was a bipartisan solution, never will be, any GOP who compromises is kicking at dead air and they realize it. The voters must do the same. No more mini solutions, no more budget extensions, no more pretend, we no longer have a problem, we must address our cancer. How does one evaluate staging without a prognosis? The damn prognosis is being ignored, continue doing what you are doing because the regime says everything is OK. The country is suing Obama. Obama is suing the states. He has ignored the decisions of judges and bypassed the Constitution. Now he threatens to bypass Congress and create his own budgeting. It all began with his bipartisan solutions.